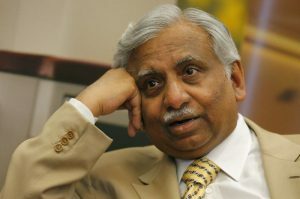 NEW DELHI/MUMBAI – Jet Airways Chairman Naresh Goyal will step down from the board of the Indian carrier he founded 25 years ago, the company said on Monday, as part of a rescue deal led by state-run banks to save the airline from bankruptcy. Saddled with debt of more than $1 billion, Jet has been on the brink of collapse, and had to ground flights as it struggled pay lenders, suppliers, pilots and leasing companies. Goyal’s departure, however, is likely to lead to potential investors coming in to save India’s oldest private airline. Tata Sons, in November, had been in talks to invest in Jet but on the condition that Goyal would step down or take a less prominent role. Under the rescue plan, Jet’s lenders, led by State Bank of India (SBI), will take a controlling stake of just over 50 percent, the airline said in a stock exchange announcement. The banks will issue a loan of 15 billion rupees ($218 million) to meet Jet’s obligations and form an interim management committee to oversee operations, it added. Bids to buy a stake in Jet will open on April 9 and close on April 30 with the expectation that a new investor will be in place by May 31, SBI Chairman Rajnish Kumar told CNBC-TV18. Even as news of Goyal’s departure led to a rally in Jet’s shares, which ended the day 12.4 percent higher, analysts say there is still a long road ahead. The next steps, which include the amount of equity capital being infused and the quality of the new board, are more critical, said CAPA India CEO Kapil Kaul. “It is critical to have a world class board led by a chairman with proven credentials. Key strategic decisions are required now,” Kaul said. The short timeline for the lenders’ plan to sell their controlling stake is also ambitious unless they have an investor in mind, Kaul said. The banks have converted only 1 rupee ($0.0145) of their debt into the stake of just over 50 percent. That means the airline still needs to service all of its existing loans and it owes millions of dollars to leasing companies. It also needs to pay months’ worth of salaries to pilots and other senior employees. Pilots have threatened to go on strike unless there is a robust rescue plan, including payments, in place by March 31. Goyal’s wife, Anita, with whom he set up the full-service carrier at a time when state-run Air India was the only real formidable opponent, will also step down from the board. Jet has survived collapse once before when it also got close to running out of cash in 2013. On that occasion, Abu Dhabi’s Etihad Airways bought a 24 percent stake in the airline to keep it running. “Today is indeed a sad day for Indian aviation,” said Ajay Singh, chairman and managing director at rival SpiceJet, adding that Goyal and Anita made India proud by launching a “world class” airline. Singh said this is also a wake-up call for Indian policy makers. “We urgently need to address structural challenges that make India’s airlines uncompetitive to airlines around the world,” he said.